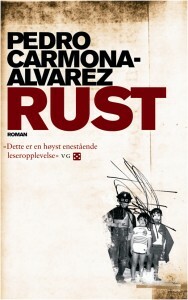 The first part of Rust takes place in Norway, and is about Thomas, Passolini and Daniel who play in a rock band and live a privileged bohemian life until one day the enigmatic and brilliantly talented Passolini suddenly disappears and leaves his friends in a vacuum. The second part of the novel takes place in Buenos Aires and tells the life stories of a group of Latin Americans – almost all of them have lived in exile (Passolini is one of them) – until they assassinate eight closely selected persons, military doctors, torturers and squealers. The author: Pedro Carmona-Alvarez was born in La Serena, Chile in 1972. As a ten year old he and his family fled to Argentina, and later the family moved to Norway. He made his debut with a collection of poetry in 1997, and has since then published four well received books. He has been awarded several literary prizes, most notably the Sult Prize 2005, The Norwegian Poetry Book Club Prize 2005, the Diktartavla 2010 and the P2-Radio-listeners novel prize 2012.